Surgical procurement of adequate tissue can be challenging. This presentation will be an in-depth look at rapid on-site evaluation of tissue biopsies from various sites. Best practices for handling, grossing and histology sectioning of tissue biopsies for companion diagnostics will be discussed. This will be followed by a brief overview of this approach applied to immunohistochemistry stains and fluorescence in situ hybridization. In this webinar, Dr. Flores will summarize the PD-L1 testing assays currently available on market and address the importance of understanding the different scoring algorithms developed for their respective PD-1/PD-L1 immunotherapies. You will learn about a system approach to testing and where to find further information on how to appropriately interpret the specific PD-L1 assay you are working with. Immunotherapy is changing the cancer care paradigm: for a small but significant group of patients, cancer has become a chronic disease and immunotherapy biomarkers like PD-L1 play an important role. In this presentation, Professor Kerr will provide a summary of the immunotherapy treatment landscape, address what makes immunotherapy biomarkers unique compared to biomarkers like HER-2 and ALK, describe the function (physiologic and as a biomarker) of PD-L1 and other biomarkers relevant to the PD-1/PD-L1 pathway. He will also address the role of emerging immunotherapy biomarkers that are independent of the PD-1/PD-L1 pathway. 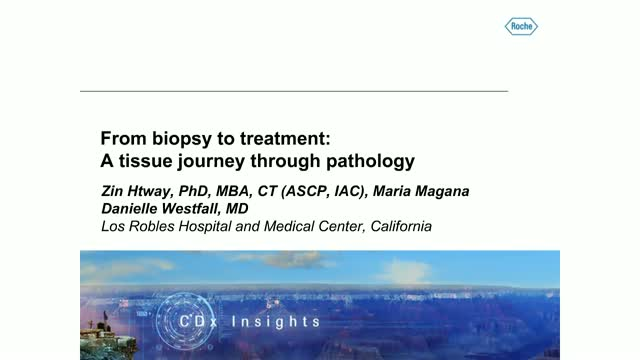 Join us for the March CDx Insights webinar “Large B-Cell Lymphomas: WHO 2016 Classification Update and Predictive Biomarkers.” Our speaker is Yaso Natkunam, MD, PhD, Professor of Pathology and Director of Hematopathology at Stanford University School of Medicine. Dr Natkunam will review key updates to the classifications of large B-cell lymphomas in the “2016 revision of the World Health Organization classification of lymphoid neoplasms.” She will also discuss the role of diagnostic and predictive biomarkers in DLBCL, high grade B-cell lymphoma and other large B-cell lymphomas. Tom Grogan, MD, Founder, Senior Vice President, Ventana Medical Systems Inc.
View two new CDx Insights videos “Part 1: CDx, IHC and tumor heterogeneity” and “Part 2: Tumor heterogeneity and immuno-oncology” with Tom Grogan, MD, Founder and Senior Vice President of Scientific Affairs of Ventana Medical Systems, Inc. Dr. Grogan addresses the role of IHC in companion diagnostics, assessment of heterogeneity and the interplay between the immune system and cancer. Tom Grogan, MD,Senior Vice President, Founder, Ventana Medical Systems Inc.
Predictive assays are a key element of personalized healthcare because these assays aid physicians in selecting individuals who are most likely or least likely to benefit from specific therapies. In addition to analytical validation, predictive assays require clinical validation to establish their clinical utility. Krista Acosta, Manager, CDx Pharma Services Assay Development, Nicole Schechter, PSM, PMP, CDx Director, Project Leader and Alton Yates PhD, Senior Manager, Clinical Sciences Management, will address the development and performance differences between predictive assays developed under in vitro diagnostic regulations and laboratory developed tests. Companion diagnostic tests are most commonly used to determine patient eligibility for specific therapies and are designed to ensure the therapy is administered safely to patients who are most likely to benefit. Thus, companion diagnostic tests are crucial in facilitating personalized healthcare for the individual patient. Join us as Keith Miller, FIBMS, Director of the United Kingdom National External Quality Assessment Scheme for Immunohistochemistry and In Situ Hybridisation (UKNEQAS-ICC&ISH), addresses the inherent risks in using laboratory developed tests as companion diagnostics, and the role of external quality assessment schemes (EQA) in helping laboratories monitor and maintain quality testing. Eric Walk MD, FCAP, Chief Medical Officer, Ventana Medical Systems, Inc.
Personalized healthcare continues to evolve. There are now five pillars of cancer therapy and two of the five, targeted therapies and immunotherapy, are personalized approaches. Join us at 9 AM MST, February 25, 2016 as Eric Walk MD, FCAP, Chief Medical Officer, Ventana Medical Systems, Inc. (Ventana), addresses how personalized healthcare has evolved and impacted cancer diagnosis and therapy. Abigail McElhinny PhD, Ventana Medical Systems Inc., and Steffan Ho, MD, PhD, Pfizer Inc. Propelled by the need to personalize medical care, more and more targeted therapies and companion diagnostics are being developed. What are the key considerations for successful co-development of companion diagnostics and targeted therapies? Join Abigail McElhinny PhD, Vice President Development, Ventana Medical Systems Inc., and Steffan Ho, MD, PhD, Executive Director, Early Development, Translational and Immuno-Oncology, Pfizer Oncology, Pfizer Inc., on November 12, 2015, 9 AM Phoenix time as they address biological, development, regulatory, and other considerations that are indispensable for success. CDx Insights is a series brought to you by Roche. We are committed to providing you with educational content, from key opinion leaders, related to personalized diagnostics. We aim to ensure on ongoing conversation is taking place in this evolving area of healthcare. Roche is a global pioneer in pharmaceuticals and diagnostics focused on advancing science to improve people’s lives. Roche is the world’s largest biotech company, with truly differentiated medicines in oncology, immunology, infectious diseases, ophthalmology and diseases of the central nervous system. Roche is also the world leader in in vitro diagnostics and tissue-based cancer diagnostics, and a frontrunner in diabetes management. The combined strengths of pharmaceuticals and diagnostics under one roof have made Roche the leader in personalised healthcare – a strategy that aims to fit the right treatment to each patient in the best way possible. Founded in 1896, Roche continues to search for better ways to prevent, diagnose and treat diseases and make a sustainable contribution to society. Twenty-nine medicines developed by Roche are included in the World Health Organization Model Lists of Essential Medicines, among them life-saving antibiotics, antimalarials and cancer medicines. Roche has been recognised as the Group Leader in sustainability within the Pharmaceuticals, Biotechnology & Life Sciences Industry eight years in a row by the Dow Jones Sustainability Indices. The Roche Group, headquartered in Basel, Switzerland, is active in over 100 countries and in 2015 employed more than 91,700 people worldwide. In 2015, Roche invested CHF 9.3 billion in R&D and posted sales of CHF 48.1 billion. Genentech, in the United States, is a wholly owned member of the Roche Group. Roche is the majority shareholder in Chugai Pharmaceutical, Japan. For more information, please visit www.roche.com.